The two-way nature of social media gives organisations the unique ability to gauge their customers’ levels of engagement. Yet too often, marketing and social media teams seek social media engagement without having a coherent strategy in place first outlining how this will be achieved. It is necessary to have a clear understanding of who your target audience is and their requirements, before producing social media content that is relevant and engaging. 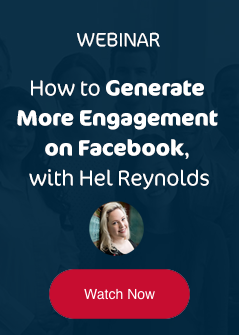 Many organisations often fail to acknowledge that social media engagement needs to be a two-way process. If customers can’t engage with an organisation on their own terms, getting a response to their questions and comments, how can an organisation expect to receive engagement when publishing their own content? For example, one of the UK’s largest travel operators had to change tack after a social media marketing campaign inadvertently rattled customers - the opposite of what they wanted to achieve. The organisation was excited about the arrival of a new fleet of vehicles and promoted them via social media. Customers on the other hand, were not interested in what new products and services were “coming soon”, they simply wanted to know that their vehicles were clean and on time. In order to develop a plan to drive engagement it’s important to understand what it involves at an enterprise level. Engagement is a measure of the level of interaction between two parties. Within the context of enterprise social media, it is primarily analysed through a group of metrics that show how engaged an audience is with a brand’s content. These include likes, comments, replies, shares and retweets. Most organisations have a good understanding of who their customers are. This is true with regards to key demographics such as age and gender but also on a more intrinsic level, as to what they are looking for in terms of product or service and what attracts them to the brand. However, this doesn’t always get translated to social media. Often, marketing teams will make assumptions about their social media audience, or there is disparity between the organisation’s target audience and its existing community of followers. All the major social media networks provide insights on followers, such as age, gender and location, allowing organisations to quickly build a profile of their actual audience. Organisations that have an in-depth understanding of their customer’s requirements are in a much better position to meet their expectations. When organisations look to engage with their customers or community on social media there is often a danger of rushing to adopt as many different social networks as possible in order to reach the widest audience. 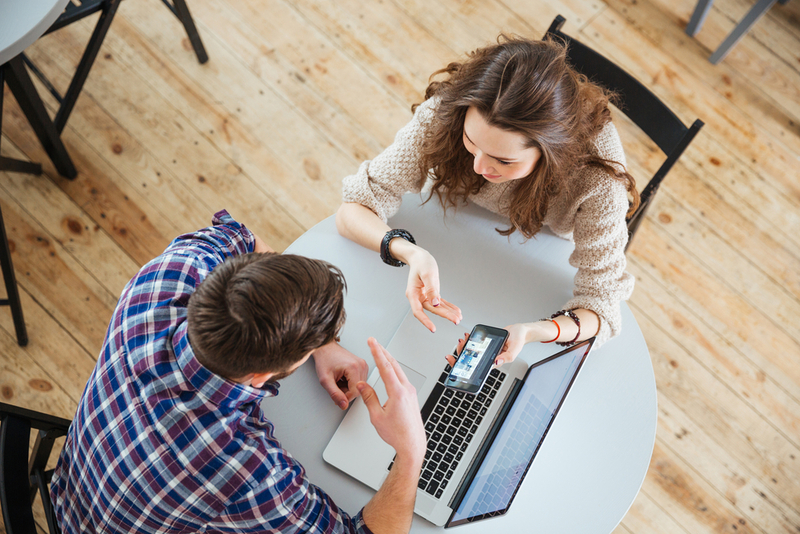 This can lead to marketing teams struggling to create and share engaging content across a wide range of networks. Research should be conducted to determine which networks the target audience are using, what makes those networks unique, and most importantly, does the organisation have the resources to adequately cater for them? Identifying the networks that customers are actively using and the types of content that they are interacting with will enable the organisation to produce content that is more relevant and engaging to the target audience. Understanding what makes a network unique can also prove very helpful in determining the engagement strategy. 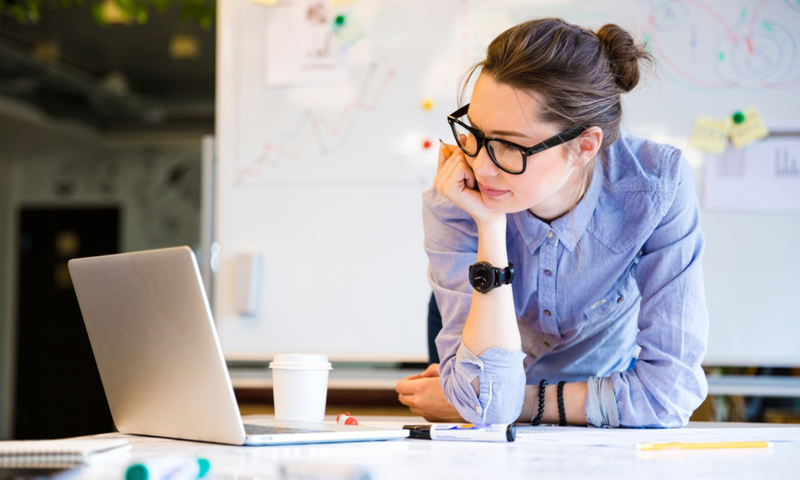 For example, Pinterest is a popular and growing network, but with approximately 70% of users being women (source: Pinterest) and the content having a strong focus on recipes, weddings and DIY crafting, it is unlikely to be relevant for all organisations. The purpose of conducting research is that it allows an organisation to tailor their content to fit audience expectations. If most respondents to a social poll or survey indicate the primary reason they follow a brand is for special offers, then this type of content needs to be included in the content strategy. Similarly, if the focus for customers is on gathering information then a proportion of the outbound content should include FAQ posts, how to videos and other educational content. Determining the right mix of content between these different categories or topics, before embarking on a content plan, is a useful way of ensuring that all objectives are met and that it is meeting the demands of the customers. Setting up dedicated social media accounts for a specific purpose like answering customer service enquiries can also help maintain consistent content. For example, North Lanarkshire Council set up social media specifically to publish winter weather information, providing vital updates to the public about school closures, road and traffic information, and sever weather warnings. If a customer starts to follow a social media account to receive specific information, then you could lose them by publishing new, unrelated types of content via the same account. Publishing content to inform, educate or entertain social media audiences might seem like common sense, but the organisation also has its own business objectives to achieve by using social media. Whether it is driving online sales, promoting marketing campaigns or raising awareness of the brand, there are a wide range of business outcomes that social media can deliver. Social media needs to support and drive the organisation’s overarching business objectives, which in turn can shape the social media content strategy. The key to achieving these objectives is balance. Organisations that balance customer / audience content with business-driven content are more likely to see interaction across a diverse range of posts and to have a more active and engaged following. Compare this to those organisations that only publish self-promoting content like sales and marketing messages. In other words, a customer is more likely to respond positively to a sales-related post once they have already engaged with some other content that offers them value by educating or entertaining them. 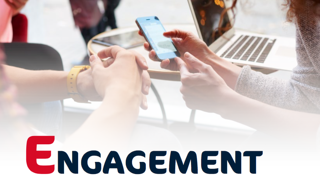 Engagement on social media is a two-way process and organisations can’t afford to publish outbound content and then ignore any inbound messages they receive but don’t want to handle, such as complaints. Edison Research found that 42% of customers who complain on social media expect a response from the organisation within 60 minutes! If complaints are not acknowledged, those unhappy customers will grow frustrated and can sometimes post elsewhere on social media. For example, they might choose to reply to unrelated marketing posts on the organisation’s social media accounts, creating a toxic environment, making it unlikely for other customers to respond and engage in a positive conversation. Instead, a strategy needs to be put in place around responding to inbound posts. By setting response- rate targets internally and acknowledging messages with a relevant response as soon as possible, these negative situations can become positive demonstrations of the quality of the organisation’s customer service. 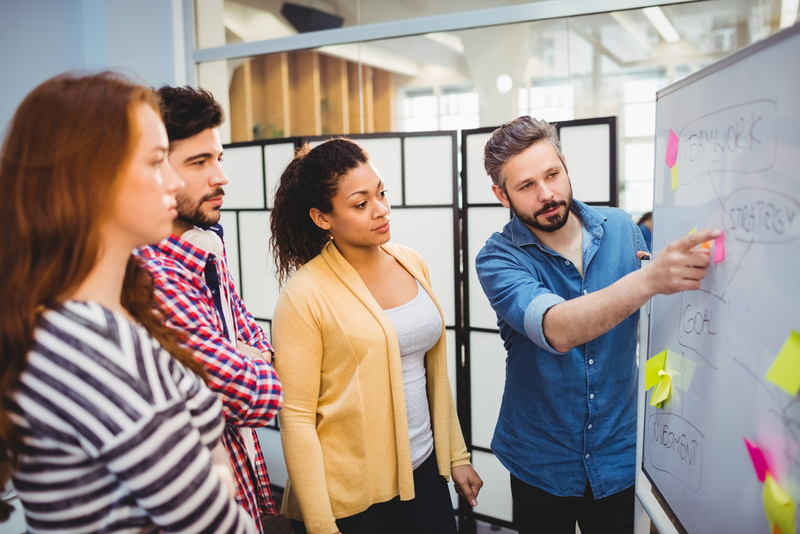 In a large and complex organisation, the best-placed group to respond to these interactions is usually a dedicated customer service team, or a local team who have a good understanding of the customers. This blog is an excerpt from The Complete Guide to Enterprise Social Media. 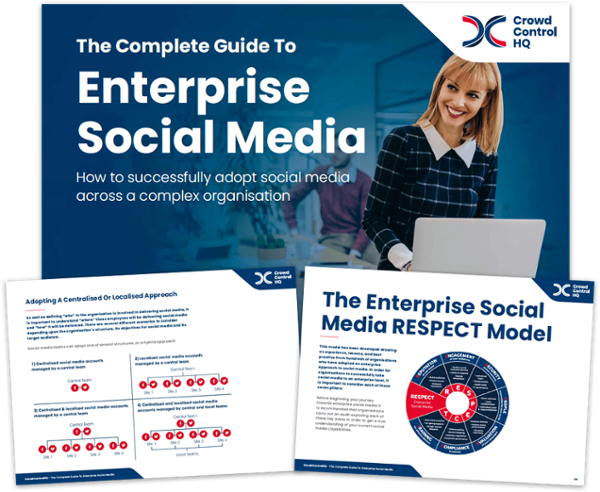 Download the guide to read more about adopting social media across a large or complex organisation.